Here's my latest play for the dragonfly model. 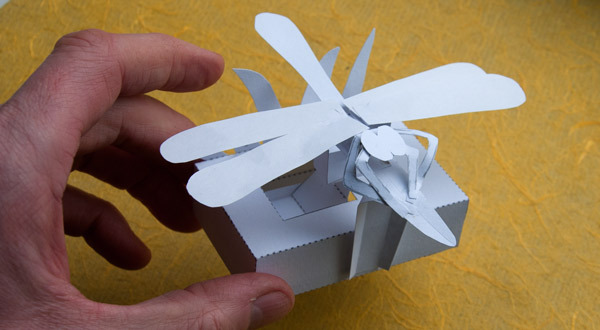 The dragonfly sits on a single long blade of grass which starts at one side of the box, curves over and is joined to the other side with a support. 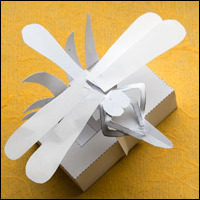 Touch the box and the pendulum vibrates fluttering the wings. I originally had the leaf curve upwards at the end but it works better curving down so that there is room for the legs and head, hence the distorted shape of the support. I have a few more changes to make. I'm going to extend the length of the piece sticking out the side of the pendulum to increase the range of movement. I'm also going to change the wing linkage (arrowed) from its current layout (top sketch) to a simpler one (bottom sketch.) I had originally used the square layout so that the push rods wouldn't catch on the leaf. Turns out they don't anyway so I can use the simpler, more stable double push rod.